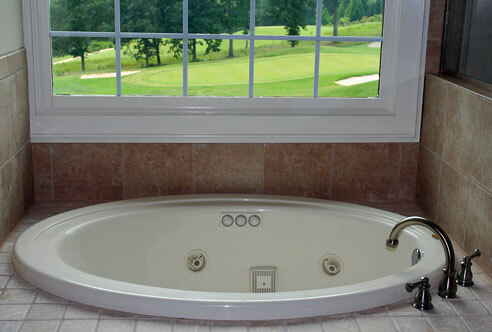 Whirlpool tubs, also known as jetted tubs, are essentially bathtubs that feature a number of therapeutic jets positioned around the sides of the tub. A combination of air and water, or air alone, is forced through the jets and produces a massaging action. There are usually four to eight jets in a whirlpool tub, and they are often positioned to target certain areas of the body such as the neck, back, and arms. Smaller jets may be positioned in areas that target more sensitive parts of the body, like feet. The jets are normally able to open, close, and swivel, allowing the user to adjust pressure and flow. Whirlpool tubs are widely recognized for the health benefits of their hydrotherapy action, including muscle relaxation, improved blood circulation, and increased skin oxygenation. After a long day at work — or working out — a whirlpool bath can be an ideal solution to relieve tense and aching muscles! However, these tubs may not be suitable for the elderly, young children, and people with certain medical conditions. Whirlpool tubs are a popular upgrade when remodeling a master bathroom, and they come in a wide range of shapes and sizes. You can even slide some of them right into your existing tub alcove. Others are made for corners; still others are made to be dropped into decking. 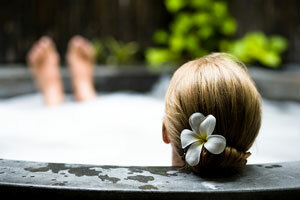 In contrast to spas and hot tubs, which are designed to retain their water between uses, a whirlpool tub must be filled and drained with each use. Whirlpools vary in size, holding anywhere from 25 to 150 gallons of water. In addition to safety features like built-in grab bars and slip-resistant floors, whirlpools come with a whole host of feature options, such as underwater lighting and integrated stereo systems. Whirlpool bathtubs range in price from affordable to extravagant, based upon their size, features, and options. When installing a whirlpool tub, be sure that the floor can support the extra weight of a full tub, provide service access to the tub water pump, and make sure that the hot water supply is sufficient to handle the tub's requirements. Take a few moments to browse this WhirlpoolTubs.us website, where you can find several major whirlpool tub suppliers. Manufactures a selection of whirlpools, bathroom fixtures, and faucets. Designer and maker of whirlpool baths and other bathroom fixtures. Manufacturer of whirlpool tubs, spas, and bath shower combinations. Offers a line of whirlpools with enhanced hydrotherapy massage action. 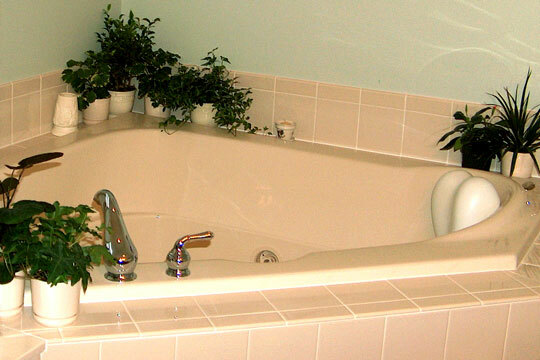 Manufacturer of jetted baths, soaking baths, air baths, and outdoor spas. Industry leader in luxury hydrotherapeutic bath products. Designer and manufacturer of quality hydrotherapeutic whirlpool baths. Manufacturer of whirlpool tubs, shower bases, air baths, and accessories. Manufactures whirlpool baths and accessories to suit your lifestyle. Offers a whirlpool bath that functions by air injection alone. Bathroom Design - bathroom ideas, layouts, and trends. The site includes a USA bathroom designer and remodeler directory. Bathroom Faucets - bathroom sink, tub, and shower faucets. Bathroom Fixtures - other fixtures to match your whirlpool tub.